Our San Francisco accident attorney knows that transportation safety is not limited to cars, trucks, and SUVs. This week, a story in the San Francisco Chronicle served as a tragic reminder that San Francisco train accidents can also be fatal. An individual in a wheelchair fell onto the rail tracks on Monday at Muni Metro’s Civic Center Station. The man’s leg was severed when he was run over by a train. Emergency response crews were alerted by witnesses to the crash and arrived at the scene just before 11:30 A.M. The victim died at the hospital as a result of his injuries. Authorities have not yet released the man’s name but reports indicate he was in his 50s or 60s. It is not yet clear how the man fell but early reports suggest the fall was accidental. The Federal Railway Administration reports that over 11,000 railroad/train incidents occurred in 2011. This figure includes train and highway rail accidents, issues stemming from trespassing, and other events that caused death, injury, or illness involving railroads. These incidents caused 712 fatalities and 8,033 additional injuries. Train safety is important for both pedestrians and drivers. Today’s trains are often quieter than in the past so vigilance is particularly key. The average train weighs about 200 tons and trains can weigh as much as 6,000 tons. Trains take time to come to a complete stop and cannot veer around objects in their path. It is thus vital for all of us to exercise extreme caution around trains and railway tracks. 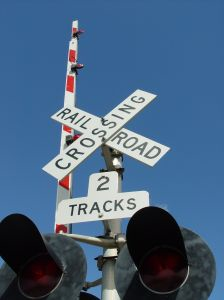 Pedestrians should only cross railroad tracks at specified crossing sites and should obey all signs and signals. Walking on railroad tracks in dangerous and usually also constitutes illegal trespassing. Individuals waiting for a train at a station should always remain behind marked safety lines until the train has come to a complete stop. You should not assume that trains will only arrive on schedule and should be alert for a train anytime you are walking or standing near train tracks. It is never safe to walk on railroad bridges since they usually do not have room for both a pedestrian and a train. Drivers should exercise similar caution and should always look before driving across tracks and should obey all railway signs and signals. Drivers should not attempt to drive around gate arms and should never attempt to beat a train that appears to be moving slowly. Multiple trains can be travelling in relatively quick succession so you cannot assume it is safe to proceed across tracks the moment a train has passed. If your car stalls and will not restart while crossing railroad tracks, the driver and all passengers should get out of the vehicle and remain away from the tracks while awaiting assistance. Our San Francisco injury attorney understands the complexity of Northern California train collisions. Each case requires a detailed and specific legal analysis. Please call our team to arrange a free consultation to discuss your unique case and how we can help you obtain compensation for your injuries.